There is nothing more beautiful than springtime in Tennessee. I love the smell of freshly cut grass, the feel of the first time I walk outside barefoot and the sound of soft April rain. I’ve been toying with the idea for this DIY flower box for a while and finally decided it was time to bring it to life. It will be a reminder to myself that the rain we’ve had so much of in March will probably continue in April, but the results will be worth it in May when everything blooms. April showers bring May flowers! Smoothfoam makes this DIY flower box look very substantial, but it’s light as a feather and was very easy to construct. I’ll hang it in my studio, where two sets of double patio doors make me feel like I’m outside all the time, although it could be hung on a covered porch or propped on an antique rocker for a splash of color in a bedroom. Learn how to make these homemade spring decorations below. Cut the following six pieces off of one end of the Smoothfoam sheet: 4” x 12”; 3” x 11”; 2-¾” x 10 ¾” (two); 3” x 4″ (two). The remaining length will be the backboard of the project. Construct the flower box section by gluing the two 3” x 4” Smoothfoam pieces to the sides of the 4” x 12” piece. 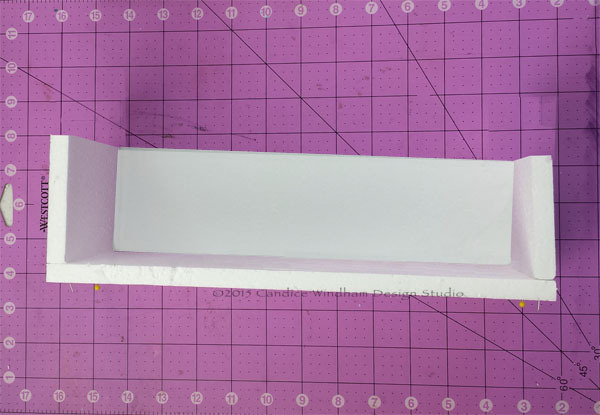 Glue the 3” x 11” piece to the inside bottom and sides of the box and glue the entire box at the base of the Smoothfoam back board. Glue the remaining two pieces in the bottom of the flower box to anchor the silk flowers. 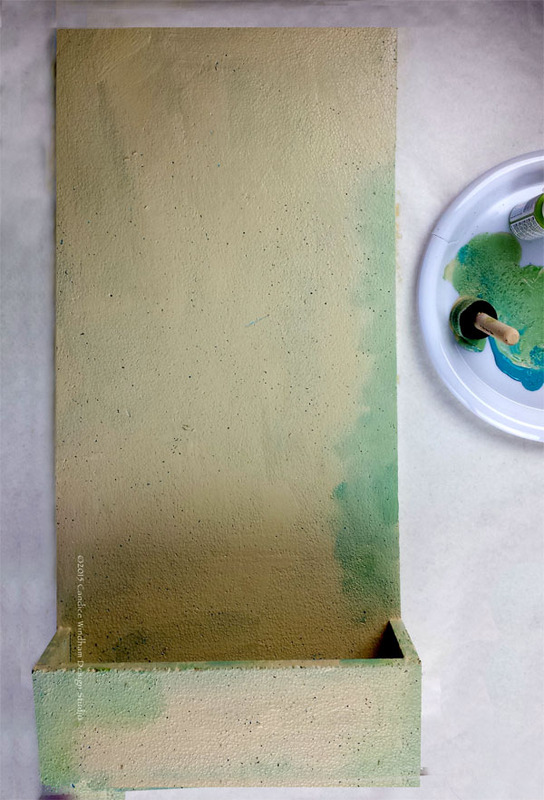 Paint the backboard and the box cream and blend in blue and green around the edges. Cut the Smoothfoam half-ball in half for the umbrella. To determine the center, pin a thin ribbon or string on the pilot hole in the back and at the peg on the other side. Stretch the string tight and draw a line along the side to create your cutting line. To make a cutting template for the botton of the umbrella, cut a strip of cardstock the width of the hall-ball and about 4 inches tall. Use the edge of a small plate to trace three arches along the strip on the front lower edge and cut out. 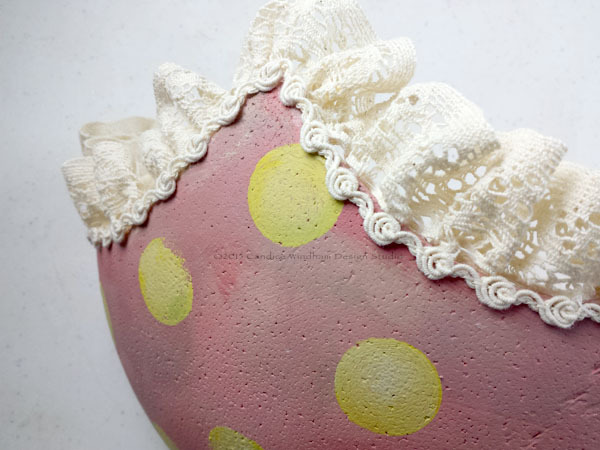 Pin the template to the bottom of the cut ball and trim away the foam inside the arches. Don’’t worry about getting a perfect edge – this will be painted and covered with lace. Paint the cut ball inside and out with coral and let dry. 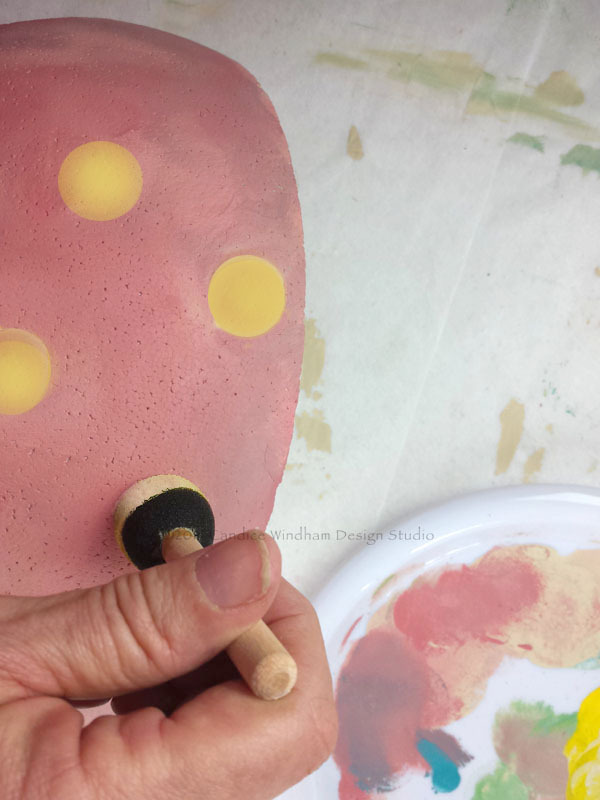 Then add cream dots with the round sponge dauber. Paint the inside of the arch edges cream. Gather the 1-¼” lace into ruffles with needle and thread and pin it to the cardstock arches at the front of the cut edge to hold it in place. Apply the adhesive along the base of the gathered edge, push the lace down to touch the glue and leave the pins in place until it dries. Adhere the small cotton trim along the front of the arches. Adhere the half-ball about four inches below the top edge of the backboard. 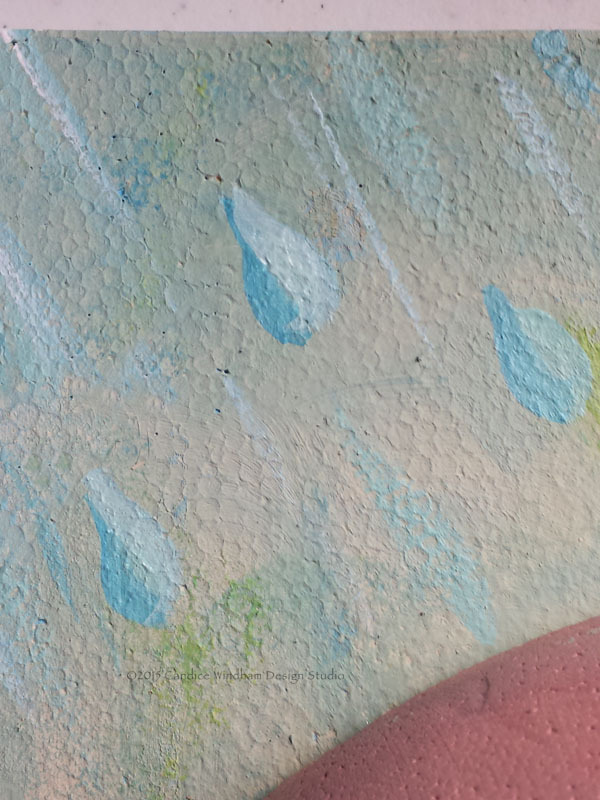 Use blue, green and white paint to add the rain drops above the half-ball. Thread the beads on to a 4″ piece of wire, leaving a ½” piece at the bottom. Cut the top wire at about ½” and fold it back down into the top bead. Dip the bottom wire in adhesive and insert it at the top center back of the half-ball. To make the umbrella handle, cut the hook off the coat hanger and twist the hanger into a J shape. Fold and insert a 6” length wire about ½” from the top of the backboard. Place the hanger under the half-ball at the top. Push both ends of the wire through the backboard and carefully twist and make a hanging loop on the back board to secure it in place. Note: I left the base of the hanger unattached, but you can place a small amount of glue on the rounded hook to secure the bottom to the backboard. 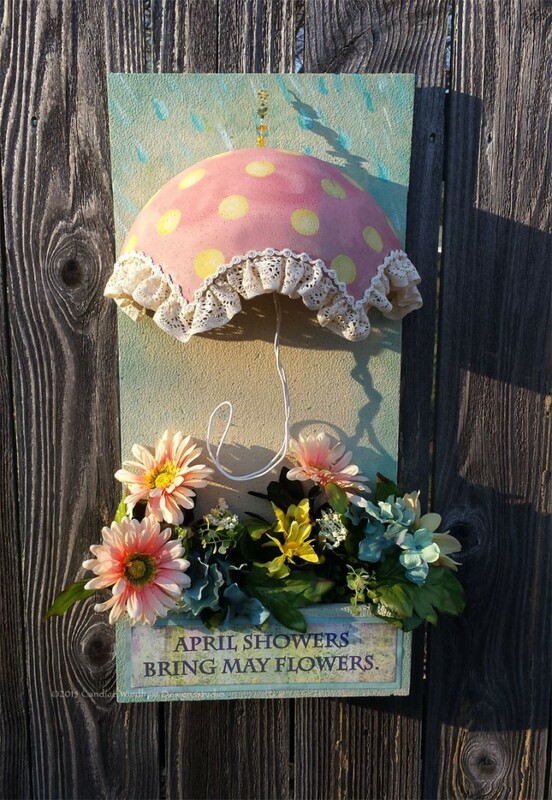 Print a sentiment like “April showers bring May flowers” on cardstock and trim it to 3″ x 11”. Cut a contrasting sheet of cardstock 1/2″ larger as a mat. Sponge ink on the edges of both pieces. Spread a thin coat of adhesive to cover the entire back of the sign and press it on top of the mat. Repeat to adhere the sign to the front of the flower box. Trim some silk flowers and add them to the box, carefully pushing them in far enough to secure them, but avoiding running them through to the bottom. This entry was posted in Home Décor Crafts and tagged Ball, Flowers, Garden, Green, Pink, Sheet, Sign, Wallhanging by Candice Windham. Bookmark the permalink. This is adorable, Candice! Such pretty colors and perfect for Springtime!